PLEASANT EVENING : It is a very pleasant evening across the Findlay and Hancock County Area. Temperatures are currently falling through the 60s late this evening. Skies are generally clear across the area. Some patchy fog is also possible through the remainder of tonight. Low temperatures are forecast to drop back into the upper 40s and lower 50s by Sunrise Thursday. GREAT WEATHER CONTINUES : This great stretch of weather is forecast to continue through the first portion of this upcoming weekend. Thursday through most of the day on Saturday will feature ample amounts of sunshine during the day, along with mainly clear skies at night. High temperatures during this period are forecast to range from the middle to upper 70s. Low temperatures are forecast to be down into the lower and middle 50s. FINALLY : As the old saying goes, all good things must come to an end. Saturday Night, along with the daytime hours on Sunday, will offer chances for showers as a low pressure area to our south and east will impact the area. The rainfall this time around will be coming in from the southeast as well. NEXT WEEK : The area of low pressure is forecast to move out of the region at the beginning of next week. A brief clearing trend is in the forecast. Chances for rainfall return to the forecast for the first portion of next week. 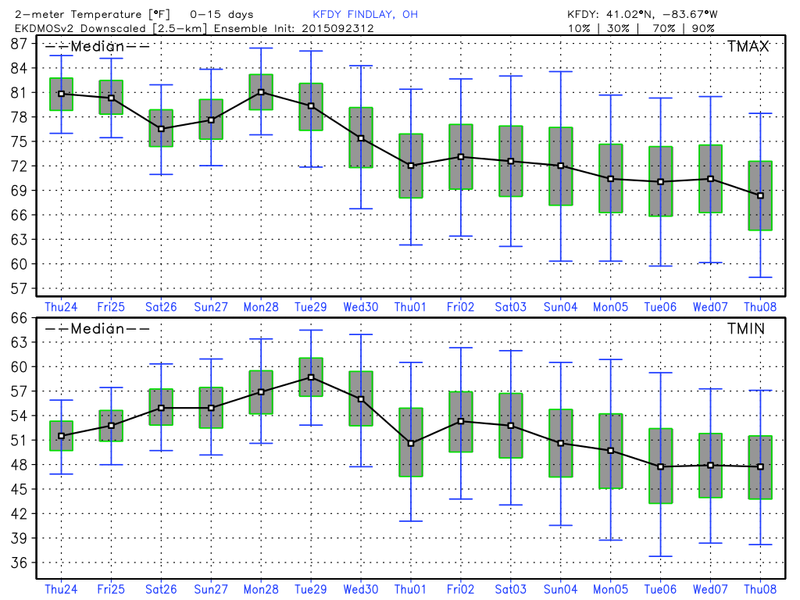 Temperatures overall for the first part of next week look to remain in the middle and upper 70s. A cooling trend is forecast to move back into the area for midweek. LOOK AHEAD : The long range ensembles continue to be in general agreement with the raw forecast data for seasonal temperatures in the next seven to ten days. 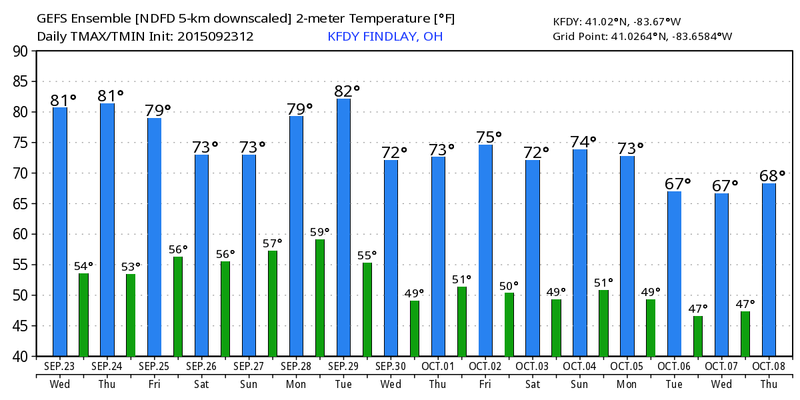 As we head into October, temperatures show the potential of cooling down even more. Look for the next Findlay and Hancock County Forecast Discussion sometime Thursday Afternoon or Evening. Enjoy the rest of your evening!